Raised Split Ranch in South Dennis. Two master bedrooms with two brand new queen-size beds. There are a children or guest bedroom with two twin-size beds and another extra bedroom with wood fireplace in it and two brand new futons full-size. Two full bathrooms (one with bathtub and the other one with shower in it). Very sunny living room with picture window attached by a dining room and a big kitchen (eat in kitchen). Beside the dining room is attached a nice leveled back deck, covered by white-blue striped canvas, including outdoor table, 8 plastic chairs, plastic bed and gas grill hooked up with the gas pipe of the house. There is a garage, outdoor shower covered with curtain, shed and very beautiful front and back yards. There is one refrigerator, electric stove with double oven, dishwasher, Foreman grill, coffeemaker + filters, toaster, microwave, lobster pot and lots of pots and pans. The house is located close to the Mayfair Boat, walking distance to Follins Pond of the Bass River, where you can launch for kayaking, canoe etc. Nearby is the Dennis Rail Trail for walking and biking in the beautiful areas of Dennis, Brewster, Harwich, and Chatham. It's close to the Highland Golf Courses, Cape Cod Playhouse, restaurants, playgrounds, Scargo Lake, tennis court, soccer, basketball, baseball, football fields etc. We have decided to buy this summer vacation home as a get away home near to Boston and to the best beaches of New England. That way we can avoid the flight tickets and the stress to go somewhere else enjoying the free time with our whole family and friends in such a nice peaceful beach town. 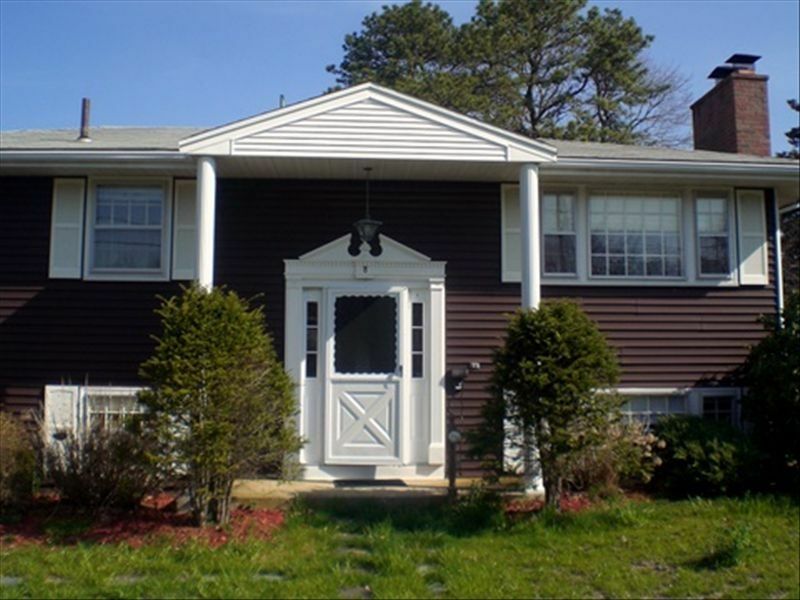 It's a wonderful quiet neighborhood, near to the best beaches of Cape Cod. It's right in the middle of Cape Code, called the heart of Cape Cod and it's convenient to go around all the towns. It's a peaceful and relaxing family vacation town. Walking distance from Follin pond and Kelly's Bay. We do not like the fireplace to be used. Two ovens. One small size and one big regular. Plus oven toaster. The back deck is covered by a blue-white stripped canvas in high protection against the heat of the sun during the hot days of the summer and that really makes it comfortable. The house is in a very quiet residential neighborhood with nice back and front yards in regular maintained landscaping. You need a car to go around the best beaches of Cape Cod (at least 7-8 minute drive to the most beautiful beaches of Chapin, Mayflower, Corporation north of Route 6A on the bay side and West Dennis Beaches on the south side of Nantucket Sound) and different activities of the towns as well as 5 minutes drive to the Patriot shopping plaza. It’s a walking distance to the children’s playgrounds, tennis and basket courts as well as to the Follins pond of the Bass River where you can launch a kayak. All the rooms have ceiling, window and floor standing fans. The bedrooms on the top floor have AC. We had 8 people staying at the house and we all had plenty of room. The deck is a big plus and the yard was nice as well. The neighborhood is residential and quiet. Alex is great to deal with. We really enjoyed our stay at this rental home. From our initial dealings with Alex, the owner and throughout our stay she was professional, responsive and very accommodating. When we arrived she even took us on a tour of the neighborhood and nearby beaches!! The house is very spacious. It had all the amenities one would need - a fully stocked kitchen, 2 bathrooms, laundry facilities and a beautiful outdoor deck. It is also very well maintained. It was well situated among various beaches and close to a local Mall. Would definitely recommend. My family and I recently visited the Cape for a few days of R&R. The house we stayed in was great. The owner, Alex, was very attentive to our needs and each time I texted her with a question she immediately responded back. The house was clean upon arrival. Each room was equipped with a fan or A/C to cool off from those hot summer days. The house was conveniently located to the beaches, grocery store, rail trail, and the gelato store. The house accommodated our family of 5 plus our dog. Overall we had an excellent time and would hope to stay there again in the future. This house would make it feel less like a rental property and more like a home that you would want to live in. Upon stepping foot in front of the home you can see a great variety of flowers surrounding the home giving you a nice and warm feeling to help you transition into vacation mode. The owner, Alex, was very kind and tentative as well. She personally came to greet us and showed us around the house and she would check up periodically to make sure everything is ok with your stay. Overall we had a great stay at this home. We enjoyed a great family vacation at the home of Alex Malita. The home is very clean and welcoming. Loved the covered porch for eating and relaxing. The kitchen is very spacious. Bedrooms are very comfortable. It was a very nice and clean place that was very comfortable. Great location and close to everything you need. The owners are extremely nice.